**Thank you for visiting! These spider web snacks are one of the most popular posts here on Mom Endeavors and have been featured in Parenting Magazine along with many other websites. If you’re visiting this post from a Facebook feature of these spider web snacks, please leave a comment & let me know where you saw the post! I’d love to know who to thank! And, if you’re interested in more fun spider ideas, you can check out the the spooky spi­der wreath (which is SO easy to make), spi­der dis­play trays, spi­der cheese­ball, or our giant lawn spi­der! 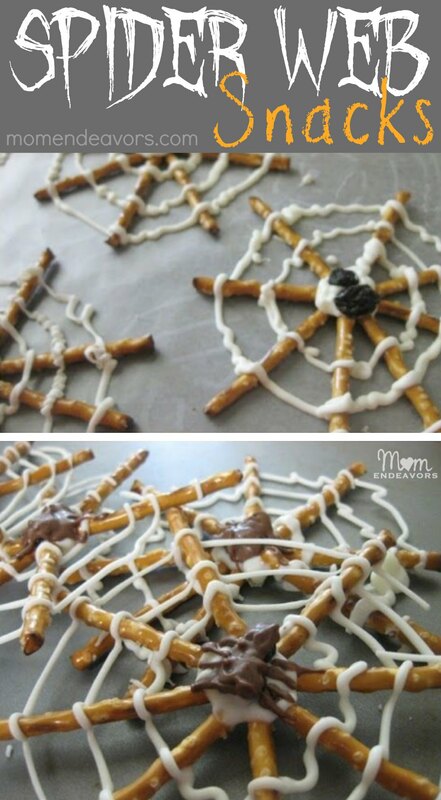 ** Now…on to these delicious edible spider web snacks… Yesterday, we made our last fun Halloween treat of the season. Who knew eating spider webs could be so yummy?! 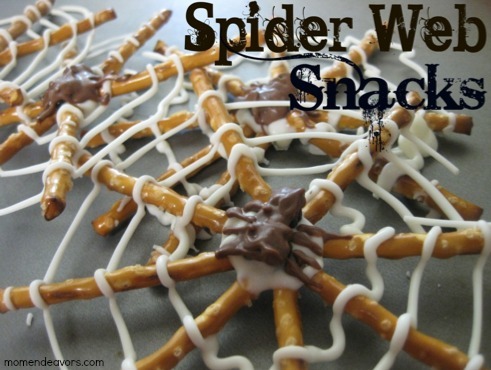 These spider web pretzel snacks are easy, inexpensive, and cute! They’re perfect for a Halloween party and just the right mix of spooky but fun for kids. For adding stability, you can even consider making them spider web “pops” like I did with these Amazing Spider-man pretzel treats! Lay out your pretzels on the wax paper in “starburst” arrangements of 6 or 8 pretzels (it’s a good idea to put it on a cookie sheet for transport stability). After melting your white chocolate/bark coating, place in a baggie and cut the corner off (or use a pastry bag). Start piping your chocolate in the middle of the pretzel arrangement, making sure to coat all the pretzels. Continue piping outward around the pretzels, until you have a web. Then, place two raisins in the middle for the body of the spider. Melt your regular chocolate and pipe over the raisins. I found that the spiders turned out better when I piped the legs of the spider first and then did the body. Place in the fridge for a few minutes until the chocolate is hard. Then, gently peel back the wax paper….and eat! You could do a fun spider-themed day and make a simple spider craft too! Love these! I am your newest follower from http://craftycierra.blogspot.com/ Follow my blog for some awesome craft ideas & giveaways! Let me know if your interested in doing a blog swap with me! Thanks! So intricate looking, love the creativity! Those are so fun! I wish I had had this last week! These are fantastic! My kids would think these were so cool and what fun to eat! Plus chocolate and pretzels together = heaven!!! This is a great idea. I love it and I'm going to have to save this idea. Thanks for stopping by and leaving the fun comments! 🙂 Glad you enjoyed these! I'm thinking maybe a similar thing could done for snowflakes this winter. We'll see! Are you aware the I am addicted to pretzels and chocolate? My kids will be making these as soon as I can get some more pretzels…this weekend. I can almost taste them now! Thanks for linking up to Theme Party Thursday! What a fun cooking activity! Even though Halloween is past, this would still be great for an S is for spider's unit. We featured this in the next Show & Tell post, thanks for linking to us! total genius! I can't wait to share with my readers near Halloween! Saw these on Pinterest. They are so cute! I’m linking to you in a post tomorrow. Thank you! Such a great idea…these are awesome!!! What a great idea!!! I am pinning this right now so I can do this with my kiddos…they are going to think I’m so cool (but I’ll be sure to give you the credit!) Thanks so much for sharing!! And…..I am now following your beautiful blog too! Welll…..it just had to be shared….I am featuring this awesome idea on my blog today! If you get a chance I would love for you to stop by and take a look! These are so cute! We’re totally making these this weekend! Thanks! Hi there! Hope you are doing well! These are so cute! My boys and I will be making them. It will be so much fun (and delicious)! I’m also going to feature theme on my site tomorrow! I hope you’ll stop by. Will I see you again at SNAP? Those are awesome! I’ll be making them soon without a doubt. My kids would LOVE these! Totally making them. Thanks for the great idea! Very clever…and HE is a cutie! Stop by to enter my giveaway for 100 printed postcards! How adorable are these?! My son would love these. I’d love for you to link up to my Wickedly Creative Halloween Ideas Party. I am in love with your spider web snack. So cute and clever! I can’t wait to make these with my little ones this Halloween Season. Thanks for sharing and I am excited to have found your website. What a great treat to make with the kids! I’ll have to do these with my boys:) Just thought I would mention I featured these on my blog today! These are just adorable! We are highlighting these on our Sassy Babies blog. We would love it if you dropped by! Thanks! I made these tonight for my son’s Spiderman party!! Thanks for the idea!! LOVE this:). I need to remember for Halloween! these look soo good, and so cute. Thanks for sharing. Saw these on Facebook and I cannot wait to make them!!! A friend is having a pumpkin carving party next weekend and I plan to make these for everyone. Thanks for sharing! “Buddy the Elf” posted these on Facebook. It was on my timeline today. Some suggested making snowflakes in the same fashion. Love it! Posted by Buddy the Elf. I found your cute pretzel spider web idea on the “Bottled-up Design” facebook page. Thanks for sharing your clever ideas! So, I made these and got rave reviews, but the ones I made broke apart very easily – especially the webs. Do you have any tips or tricks on making thicker, stronger webs with the white chocolate? I made these for a children’s halloween party today, taste tested them and they are great. So fun and easy, I love it! Fun, Sapphirine! Glad everyone enjoyed! Thanks for commenting!! this was one of those projects that looked so great online but then making them.. not the same. the project was relatively easy to do. the spiders were the most difficult. But then getting them off the wax paper.. impossible. even after putting them in the refrigerator for hours. the candy coating was just too fragile & broke. so much for the Pre-school Halloween snack.. on to the next one.. These spider pretzel treats came out perfect. They were easy and the kids got to help too. Clean up was quick also. Thanks for the idea. These spider pretzel treats came out perfect. They were easy and the kids got to help too. Clean up was quick also. Thanks for the idea. I saw these on ministry to children website. Thank you for this cute idea! Just wanted you to know it’s great for times other than Halloween. I homeschcool and we just made these while doing a Unit Study on the book Charlotte’s Web.